The Wolves just got done hosting another open scrimmage with their (star-studded) summer league roster. Wolves fans had the opportunity to see Karl-Anthony Towns and Tyus Jones for the first time play in a Timberwolves Uniform while also watching some of their favorite young pup veterans and guys they’ve never heard of. While my expectations were pretty low, it was a ton of fun. 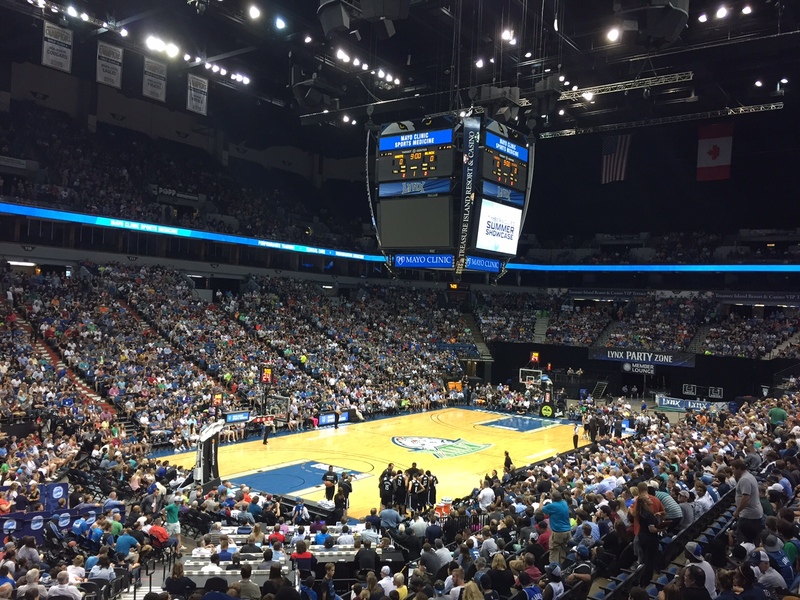 Not to mention it was free, the Target Center attracted a crowd of over 15,000 on a Wednesday night. It seemed louder than most games in there and it was interesting to see the upper levels get people sitting there. All in all, it is easily the most excitement around the Wolves that they have seen in a while. Disclaimer: This was a scrimmage. If anything said here is exaggerated, please take with a grain of salt. Not much should be made of this game. Just some bold statements to stir some conversation until basketball season starts back up. Wolves fans got to the team warm up while doing stretches and a poor attempt at the three-man weave which turned into a dunk contest. As expected we saw LaVine make dunks look effortless and Wiggins do his Rookie Game 360 dunk. What was surprising was seeing Towns do two different variations of the between-the-legs slam. The crowd was also pleased to see Brady Heslip slam. Impressions from the actual scrimmage. I am a huge LaVine fan. My expectations for him are huge. He will either have to learn to play as a two-guard that doesn’t need the ball to be effective or being a 6th man for the rest of his life. His jump shot is fluid and smooth. His ability in transition is art in motion. And his ability to use his athleticism to score around the rim will get him minutes and touches eventually. A consistent three ball paired with his ability to get to the rim is a scary combination. I have mentioned in previous posts that I don’t believe Tyus Jones will be great. Or even good. He did impress me today. He showed off his IQ on the floor. He was able to shoot but most importantly he looked like the only real point guard out there. He runs an offense pretty well for a 19 year old. He seemed to disrupt LaVine quite a bit when he was running point guard, which most people should be able to do. But there is promise in the hometown hero. If he never becomes great, I am sure the Wolves got a good amount of jersey sales out of him. Towns was pretty impressive. He had dunks I didn’t expect he could make. He hesitated on a few threes but he was able to knock one down. He over powered Dieng in the post. He showed us the jump hook that brings you flashbacks of Hakeem the Dream. And he was very active on the glass. He made some really nice passes as well. He seems like a kid who will fill in the holes in his game fairly quickly. Most importantly, he didn’t seem to need the ball to have an impact on the game. It will be interesting to see who emerges as the leader of this team over the next few years, will it be Towns or Wiggins? I believe Towns has the intangibles to be that leader. Speaking of Wiggins, he seemed to vanish in this one like he vanished early in his rookie year. His shot was off. He seemed like he wasn’t trying entirely. He won’t play for the Summer League team but he will practice with them. The Wolves are depending on his improvement this season and will need him to notice vanish like he did today. Gorgei Dieng played average. Payne was his regular self. Lorenzo Brown was impressive knowing he is fighting for a roster spot and on the verge of being cut soon. That said, it would make sense if he remained on the team as a third string or even back up point guard. There was also a Pekovic and Shabazz siting. Wolves really hope both get healthy soon. The Wolves will enter the Summer League with one of the most impressive rosters with tons of young talent. LaVine, Towns, Jones, and Payne will try to lead the Wolves to a Summer League championship. The title equates to nothing since the Kings won last summer. Dude, these posts are awesome! Keep em coming dude!! !